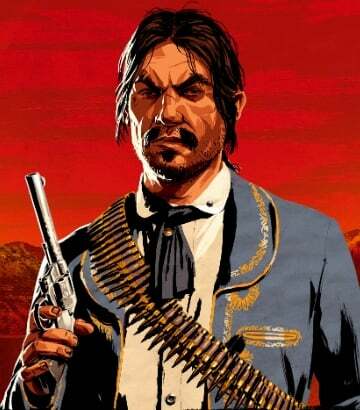 Javier Escuella is a Central Character in Red Dead Redemption 2. As an infamous bounty hunter and a revolutionary, it was hardly a challenge to convince Javier Escuella of Dutch's ideas. His commitment to a cause, and his loyalty, made him one of gang's senior members. Javier was born in Nuevo Paraiso in Mexico and was a Mexican revolutionary before joining the Van Der Linde Gang. Javier applies his trade for the Van Der Linde Gang. After the collapse of the Van Der Linde Gang, Escuella returned to Mexico to work as a Hitman for a Colonel in the Mexican Army. Eventually, he's found out to be helping conceal Bill Williamson from John Marston. He gets caught in the crossfire and is eventually trapped by John. He slyly buys himself enough time to bolt for an escape, where John can choose to kill or capture him. If he's not killed then, he later dies during incarceration.